The good news is I’ve just finished the dress I’m going to wear to my friend’s wedding on the weekend. Unless you count hemming it, which we won’t, for the purposes of this post. The bad news is it’s not the dress I was planning to make. Instead of a low-backed dress in pale blue with white polka dots, it’s a boat-necked dress covered in blue birds and butterflies. I’m not unhappy with it. In fact, it’s given me confidence that I’m improving with my sewing because it doesn’t need any tweaks to make it fit more snugly and I managed to sew the bodice lining in without pulling the front. But it’s not the dress I wanted to make and wear and I know exactly who to blame. In fact, there are two culprits: me and television. Me because I am lazy and prone to wild fits of highly polished procrastination; television because it knows how to be addictive. So for the past month, even though I knew I should have been working on my dress, I sat down for one more episode of Call the Midwife or Selling Houses Australia or Miss Fisher’s Murder Mysteries instead. It’s amazing how quickly ‘one more episode’ turns into an entire evening spent in front of the TV instead of the sewing machine. I can even convince myself I’m being productive because I’m usually knitting when I’m watching TV. But when I really stop and think about it, I’d much rather be doing useful, creative things than watching TV. Clearly, Something Must Be Done about this whole situation. My first thought was that I should give up TV entirely for a month, but that seemed to be a step too far, taken too soon. Plus, I do enjoy watching TV with the Chef, as it gives us ample opportunities to mock people and shout at them when they’re being stupid. Not a month, then. Possibly not even a week. How about I start with just one day instead? That’s how No TV Tuesdays was born. 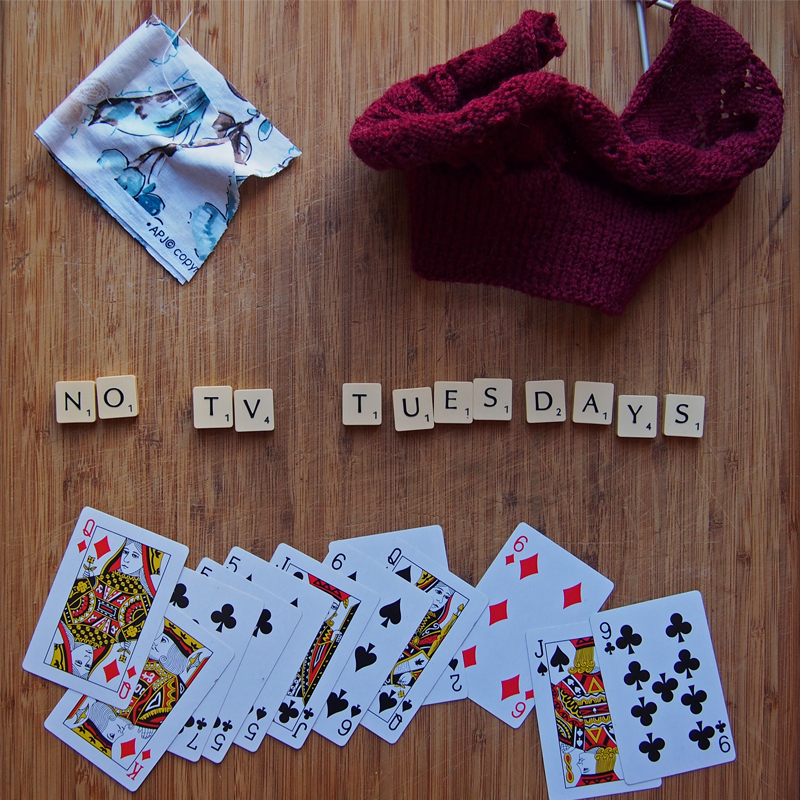 No TV Tuesdays are exactly what they sound like: a Tuesday without TV. Instead, we’ll do pre-television things such as playing games or going for a walk or sitting down with a good book. In my case, I’ll also be adding knitting and sewing into the mix, and possibly even writing. It’s an opportunity to prise ourselves away from the addiction that is television and to have a bit of old-fashioned fun. Who knows – it may even expand to other, non-alliterative days of the week, too. Are you a fellow addict? Or have you never been trapped by the siren song of television? If you have any hints for living a TV-free life, please share them in the comments! I’m a TV addict as well. I gave away my TV when I moved into my tiny little place about 3 years ago, on the understanding that I had shitloads to do (like a double degree, where one of the degrees was in Engineering) and wouldn’t have time to watch it. Instead I discovered abc’s iview. On the other hand, I’ve also finally managed to incorporate a dedicated sewing zone along one wall. That seems to be the trick; having a place for different activities. I normally sew whilst catching up with reality tv on You Tube on my computer. No wonder it took me 4 hours to make a T-shirt last night. Yes, it feels as though you’re multi-tasking, but everything seems to take so much longer than you hoped! That sounds like a success to me! 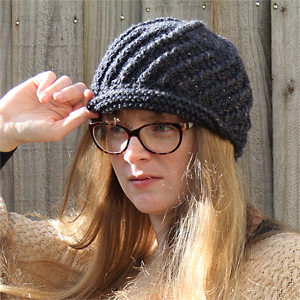 I must admit, though, I often think it would be great to listen to radio dramas when I’m knitting. This would avoid the need to occasionally look up and see what’s going on. I chucked out the TV in 2009 and so far I am doing very well without it. When prime time was equal to reality shows where the intelligence quotient of the participants was alarmingly low, I decided to get rid of the TV. I used to mock stupid people too, but then there was just too many of them… There is a TV in the current household, but I rarely watch anything anyway. Just give me Internet access and I’ll be just fine! There are definitely better ways to spend a Tuesday evening! As much as I enjoy watching various TV shows with the Chef, I’m sure we’ll have even more fun doing different things. Mr & Mrs Murder? I loved that show! It was absolutely adorable… which is a weird thing to say about a TV show about murders. The fact that there’s a third season of Miss Fisher is one of the things holding me back from giving up TV altogether. If I only choose a handful of shows to watch, then I’m hoping it will have a positive impact on my creativity levels! Oh Ya that’s it! Some things are too good to miss and we have so much trouble finding them up here! I unpick while I watch tv, it makes a boring task better and I feel like I’m doing something! I only watch two shows religiously, Friends and Project Runway. The rest of the things I watch are what my family wants to watch so i dont really mind if i miss them. I mostly sit on the couch and read while they watch TV haha. Perhaps I should pick a couple of shows to watch, too. That sounds like a possible plan. I do like the idea of using it as a distraction when unpicking – that is not the most exciting task in the world! I’m pleased to say that I am not, and have never been, a TV addict. Initially, this was because I always preferred to read rather than watch TV. More recently, it’s because I’m rarely home in the evenings, which makes it really hard to sit down and watch a show consistently. And I can’t stand being in and out of a storyline. These days I use online catch ups to stay tuned to a *particular show* week-to-week, if I really wasnt to watch it. I also tend to binge-watch programs by dint of borrowing/buying an entire season/series ta a time. But i still feel like I have as much control as I do with a good book (which is to say, not a great deal), because it’s the storyline drawing me, not the act of sitting in front of the telly. Biggest problem? My mother is a TV addict. It’s on about 14 hours a day. So there can be problems of being caught as I walk past. I like to maintain a balance between reading and TV and I’m lucky that no-one ever minds when I read during my breaks at work. In other places, my reading was looked upon as either a) rude, or, b) a desperate cry for someone to start a conversation with me. Binge-watching is sometimes unavoidable. Although my idea of binge-watching is to parcel out an episode or two of a weekend… so it’s really long-term binge-watching. I think it could be a good way to wean ourselves off TV itself – pick a couple of series to get into and stick with that. In the end, a book is always going to be so much more enjoyable. I always wanted to read during my breaks while I was on placement – but technically part of my assessment was to ‘socialise’ with staff. I felt the smartest thing to do was sit in the staffroom and actually eat with them.I don’t find it so easy, otherwise. I only caved once, when Watership Down had me in its clutches. Luckily, I work in a library, so no-one really minds much if you’re sitting there reading a book. Plus, I always keep one ear on the conversation so I can join in at any point if needed. It’s a great balance! Oh, I know all about that trap and I don’t even have a TV any more! And when I am watching stuff it is quite often crap I’ve seen before. Especially Midsomer Murders and anything Agatha Christie. By the way if you want a new addiction, try Broadchurch, Labyrinth, The Pillars of the Earth and World without End, all screened on ABC lately (although not sure if still on iView). I am trying to pretend I haven’t seen that list of addictions, but you know I’ll be storing it away for later use. ABC is the absolute worst for broadcasting addictive and delicious shows. I’m loving Dr Blake at the moment, and Miss Fisher will be coming back some time this year… Argh!